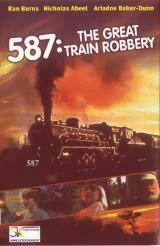 587: THE GREAT TRAIN ROBBERY is an awesome adventure, backed by an endearing cast, that will steal the hearts and minds of the entire family. A young boy discovers a fully functional steam locomotive, ''The 587'' -- destined for the scrap heap. He then sets about restoring the locomotive, with the help of his sister, an old eccentric engineer and the rest of the neighbourhood children.